EddyPham&Company can help make the difference between just having an idea to having a working concept and even tangible, marketable and a finished product. Most inventors or idea owners do not know the process to approach a working prototype or even finished product. They think just having an idea is good enough. Well it’s not, having more than just an idea is not enough. Product development is one of EPCO’s strongest areas of business and how we started within the direct response industry. Developing is more than just making prototypes, it is making sure the product works, is safe, delivers what it was designed for, has controllable COGs (cost of goods), manageable MOQs (minimum order quantities) and of course is there a market need for it (will other consumers want it). There are many ways to bring a concept to market. Inventing a consumer good is a very rewarding experience and can be expensive if one does not know what to do. Initially start with a very inexpensive if not free way to get some consumer data. Start with some simple questions to friends, family and even some people who would be considered as haters. Compile this data and find out what needs to be changed, what they would like to see from your original idea and even find out what they would be willing to pay and do they know people who would purchase. Getting simple consumer data is a good way to start your product development. "Anything that won't sell, I don't want to invent. Its sale is proof of utility, and utility is success." This is the philosophy that I like to follow as well. So the ability to sell an invention becomes the starting point from which we will begin. There are three critical and equally important phases of the idea invention process that we will follow on our road to success. It sounds simple enough. However, most inventors start with the develop phase and never make it to the market phase. Why? They don't evaluate the potential of their invention to be profitable before proceeding. Research needs to be done. Know your market size and if consumers even want the product. Your parents, friends and even favorite barista do not count. Everyone wants to skip to the Develop phase. This happens to be the most fun and exciting part of invention. The problem is that if you develop before you evaluate 9 times out 10 you will lose. It sounds harsh, but it is true. The statistics bear this out. The research within the evaluation will tell you how to develop and what direction to take the design. The Develop phase is where you will apply for a patent and build a prototype. Unfortunately, the cold hard facts are that only 2% of patents end up as commercial successes. In my opinion, the main reason is no one bothered to determine if there was a market before spending the money to file for a patent. I always say spend a little money and know where it is going before you loose a lot of money and not know where it went. Let's review the steps of the idea invention process in more detail. Properly evaluating your idea is one of the most important phases of the idea invention process. There are several different ways to evaluate your idea but the two most important are Patent Searches and Competitive Product Searches. Patent searches are critical to determining the novelty of your idea. If your idea turns up in a patent search it does not necessarily mean you will not be able to secure a patent. That all depends on the specifics of the prior patents that turn up in the search and the important factors that make up your idea. Once you are satisfied that your invention is relevant, consumers will want it and it can be sold at a profit you are ready to move on to phase two. Now we get to the fun part, developing your idea. This is my favorite part of the idea invention process, because I get to bring my invention to life. Keep in mind though that this is the stage where your idea will start to cost you more money. Be sure you are happy with the results from the Evaluation phase before proceeding. In this phase we will develop the tangible part of your invention (design and prototype). Building a physical or virtual model of your idea literally brings it to life. There are not many things that are more exciting for an inventor. Unless you are an engineer or a handyman this will most likely require the assistance of prototyping or other product development assistance. The next step in the "Develop" phase of the three phase idea invention process is to protect your idea. I always proceed with or complete the prototype phase before the patent phase. The reason is simple. You cannot patent the "what" of an invention. You can only patent the "how". This is a concept that most people do not understand. Without the "how" there is no invention. In my case and also with most inventors the "how" evolves as the invention comes to life. Unfortunately in life things don't always work out the way we anticipate. If I design a product and build a prototype, 9 times out of 10 it will not work the way I thought that it would. That is the reason I patent after prototyping. If you patent first invariably you will come up with something else that should be in the patent after you prototype. I have done this several times and learned that lesson the expensive way. Having to file two patents instead of one is an expensive mistake. Creating as much broader patent is better but not so broad where it is invalid. Some products can be sold in many distribution channels, some examples include: grocery, flea markets, mass retail, catalog and direct internet sales. The key is to determine the best channel(s) for your product. Direct response marketing has the highest profit margins because you do not have to pay distributors or retailers. Catalogs and distributors are many times the best ways for new inventions to enter the market. Most are always on the look out for new and interesting products and most are willing to work with one product companies. The other avenue to consider is patent licensing or selling your idea outright. This concept is attractive to most inventors because an established company will do most of the work for you. This is easier and more appealing than building a company from scratch to sell your product. The downside of licensing our selling your idea is that you are not likely to make as much money as if you were to build a business. Personally, I have been heavily involved in both licensing and selling my inventions to retail. Licensing is usually easier and it allows the inventor to move on to their next idea. The last point is an often overlooked one. If you plan to license your idea or sell it to a manufacturer it must be very novel, have a strong patent and offer the receiving company an advantage in their market. Many inventions do not measure up to those criteria. The three idea invention process steps are: Evaluate, Develop, and Market. If you follow the steps in order with your invention you will (hopefully) avoid spending money needlessly on a bad idea by evaluating it first. After you are confident it is a good idea through your research, you can design and prototype the idea before filing for a patent. Doing the steps in this order will once again save you money and give you the strongest patent you are entitled to. Once your idea is protected and you have tangible proof that it works with a prototype you can proceed to the final step: marketing. 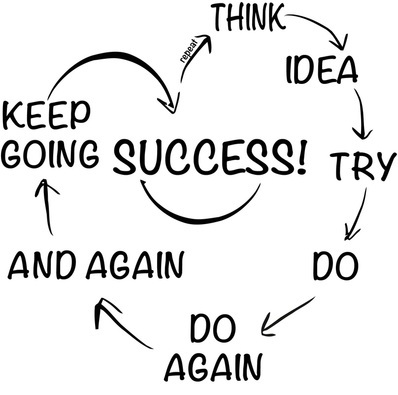 Follow the steps in the proper order and keep inventing. Good luck.